I first heard the sounds of the Coltrane ensemble on my way to the Midway Plaisance, the main location of the Hyde Park Jazz Festival. I was passing by Rockefeller Chapel, and decided to try the door and see if I could get in. No luck: it was locked. But through the cracks between the door and the frame, I could hear the muted sounds of a horn being played, and some kind of string instrument. Soundcheck. But, unable to hear much, I moved on to the Midway. The last weekend of September was cold: there were no squirrels on the ground, birds in the sky, or people on the sidewalk. Everyone was indoors, hiding from the first truly frigid day of the year—save for those attending the Hyde Park Jazz Fest, which took place on the Midway Plaisance between South Ellis and University Avenues, in one bank, at a nonprofit design center, and in several University of Chicago buildings. The Midway was where most of the action happened. Two stages, placed on opposite ends of the plaisance, gave the effect of literal back-to-back performances, with the crowd moving between sets like marbles on a seesaw. As it got darker and colder, the crowd somehow got larger. During Christian Scott aTunde Adjuah’s set, there was hardly any standing room—and it felt as if the trees that lined the Midway were crowding in to listen. Visibility was low, so aside from the vague buildings in the distance and shuttle buses passing quietly along University Avenue, the only things to see were the bandstand and the people who made up the crowd. Meanwhile, the festival continued around Hyde Park, with groups of people making their way to performances that were like rest stops on a long highway: cold, cold, cold, jazz; cold, cold, cold, jazz. At the Logan Center for the Arts, Brandee Younger gave a talk on the life and art of Alice Coltrane. That night, between eleven and midnight, Younger, as the festival headliner, would play Alice Coltrane’s music with Coltrane’s son, Ravi. Held in the cavernous Rockefeller Chapel, the performance was an extension of an ongoing project of Coltrane’s dedicated to his mother’s music, called Universal Consciousness: Melodic Meditations of Alice Coltrane. For most of the day, events were scheduled at the same time: JoAnn Daugherty conflicted with Isaiah Collier, Gustavo Cortiñas with the Ernie Adams trio, Maggie Brown’s Vision Ensemble with Mike Reed’s “The City was Yellow: The Chicago Suite.” But nobody competed with the Coltrane show. A small crowd had gathered at Rockefeller by 10:30pm, but the outside doors of the chapel opened half an hour before the inner ones—leaving about fifty people rubbing their hands in the heated front room, making small talk to keep busy, occasionally peeking through the windows. Music could be heard here: the soundcheck was being performed with longer and longer stretches of solo and group music. A few visitors left: they decided that the wait was too long, or that the concert would end too late. But the rest got comfortable. Eventually, the crowd was let in. The front three aisles were reserved ahead of time (for those who had bought Jazz Passes—fair enough at a free festival), but everybody else got as close to the front as they could. After that, we had to wait another fifteen or twenty minutes, sitting in front of an empty stage. Tick, tock. Somebody behind me whispered:“They’re running on jazz time.” As if in reply, Kate Dumbleton, the festival’s artistic director, got up to the podium to announce that the show would be starting immediately. As the band started to play, it became clear that even though you needed to pay to sit in the front, the sound carried just fine all the way to the back. Coltrane’s ensemble opened with “Journey in Satchidananda,” one of Alice Coltrane’s most famous songs—and they played it breathtakingly. There were more than a few transformative moments in the cathedral, where music echoed off every surface. Younger’s harp started to look like the mouth of a baleen whale; when she hit a certain note, it began to sound like a lute. Set beside Coltrane’s soprano sax, it seemed like a pair of angel wings. The music, too, transformed from genre to genre and sound to sound. In Coltrane’s saxophone, you could sometimes hear the romantic undertow of his father’s “Coltrane for Lovers,” and, just as often, the netherworld honk of Albert Ayler. Johnathan Blake dragged the tip of his drumstick over the top of a cymbal to create a low-pitched (and somehow pleasing) screech, which felt like it resonated on your skin. 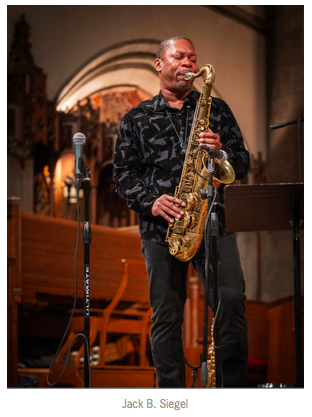 At one point, Rashaan Carter took a bass solo so long and intense that Coltrane and Younger were able to step away from their instruments and have a whole conversation without fear of being overheard. Briefly, between two of the final songs, Coltrane took the mic to announce the songs they’d just played and what was coming up. But when he spoke, for the first time all night, you thought, That’s not his voice! It was like a well-known actor suddenly putting on an accent. You thought, The saxophone is his voice! Coltrane announced that they’d just finished playing “Respected Destroyer” (Younger’s composition, and the only non-Alice tune played that night), and “Blue Nile” from his mother’s album Ptah, the El Daoud. Then, the band got back to business. As the show ended and the band bowed, just about every positive human vocalization could be heard from somewhere in the audience: wolf whistles, woo-wee’s, one huge “YEAAAAH.” It was midnight, and suddenly it was Sunday in Church. Kyle Oleksiuk is a contributor to the Weekly and student at the University of Chicago. He last wrote about South Shore’s Back Alley Jazz Fest.